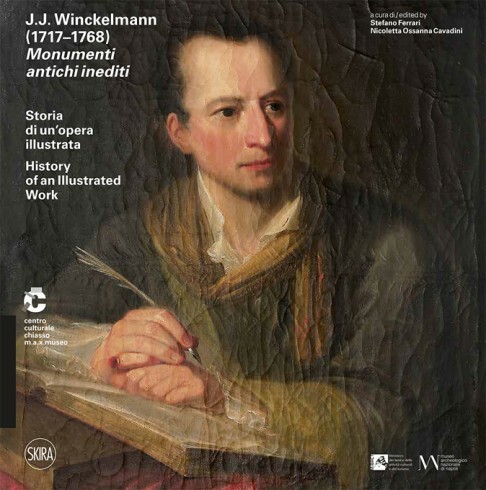 To mark the 300th anniversary of the birth of Johann Joachim Winckelmann (1717-68) – one of the finest scholars of classical culture, theorist and the father of the discipline of art history – the catalogue and exhibition explore his penultimate printed work titled “Monumenti antichi inediti”. To date the work has been little studied, because it was considered incomplete, yet it is fundamental to understanding the world of classical antiquity. 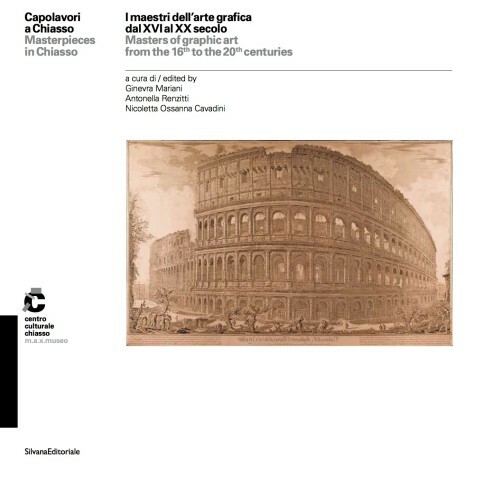 For the first time the author significantly inserted no fewer than 208 illustrations of the ancient “monuments”, describing them in an absolutely innovative vision that combined descriptions and depictions (all published in the catalogue). The catalogue presents both the first edition of 1767, the Neapolitan reprint of 1820-23 and the Roman edition of 1821 with Stefano Raffei’s addenda, as well as the preparatory manuscripts, twenty matrices, fourteen proof prints, portraits of Winckelmann, paintings and archaeological relics, together with a documentary section. Though his premature death prevented Winckelmann from completing his work, its principal continuers, from Seroux d’Agincourt to Leopoldo Cicognara, Luigi Rossini and Giovanni Volpato, considered the “Monumenti antichi” a true model for the divulgation of art history. The exhibition presents a broad selection of geographic maps – preparatory drawings, watercolours, woodcuts, wood engravings and etchings, and lithographs – as well as plans and views of cities that became common in the fifteenth century through the invention of the press. However, it was the techniques of lithography and photolithography during the nineteenth century that allowed a wider range of solutions, leading to the enthralling and unexpected virtuosity of the bird’s eye view drawing. 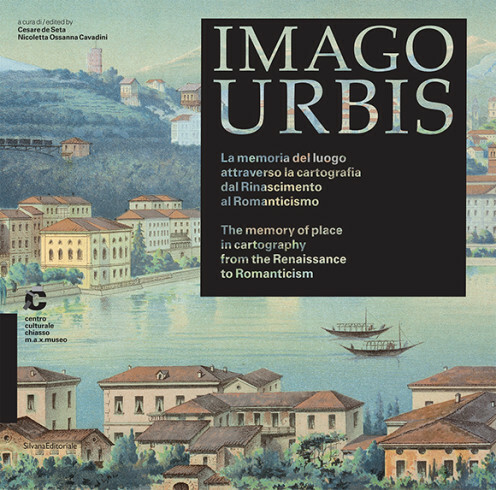 This journey to favoured destinations – Rome, Florence, Naples, Milan, Paris, Vienna, Geneva, Zurich, Basel, Berlin, London and St. Petersburg – is enriched with plans and perspective views that depict in greater detail the transformations, changes and new developments in major European cities. Known primarily as painter, poet and philosopher, to mark the four hundredth anniversary of his birth, Salvator Rosa as engraver (1615-73) is presented through his preparatory drawings, refined copper matrices and the prints made from them. 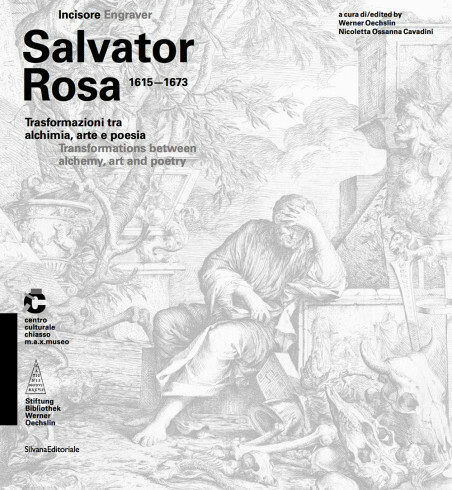 The catalogue also examines the critical reception of Salvator Rosa in northern Europe (Germany and England) through the dissemination of his hieratic prints with their unusual iconography and his famous satires published posthumously. Complex, chaotic and extremely gifted, the great Baroque master expressed his enduring curiosity and spirit of wonder in stoical, mythological and philosophical paintings that touch on esoteric, alchemical and magical themes as well as the musical and poetic. 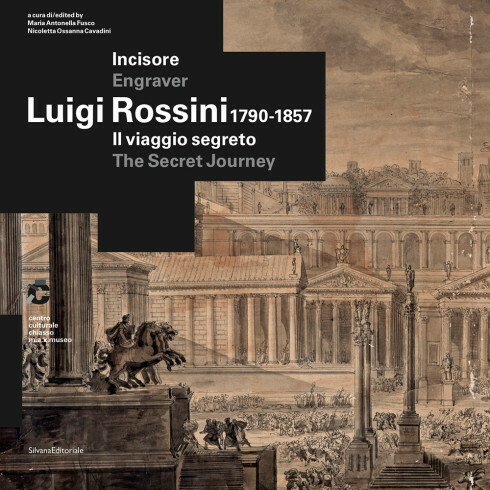 Luigi Rossini (1790-1857), a master of the art of engraving, is recognised by critics as the last great illustrator of the wonders of Rome after Giuseppe Vasi and Giovanni Battista Piranesi and before the advent of photography. The cousin of the composer Gioachino Rossini, a friend and colleague of the sculptor Adamo Tadolini, Rossini worked for his whole life with Bartolomeo Pinelli, enjoying the esteem and protection of Antonio Canova and Vincenzo Camuccini. The catalogue contains a broad selection of his output – watercoloured drawings preparatory to the engravings, copper matrices, sketches and prints – revealing his passion for art and archaeology. The volume presents a significant selection of matrices, many accompanied by the prints made from them, kept in the Istituto Nazionale per la Grafica in Rome. They document Italian engravings from the 16th century to today’s works by famous artists, including Marcantonio Raimondi, Federico Barocci, Giovanni Benedetto Castiglione, Salvator Rosa, Giuseppe Vasi, Giovanni Battista Piranesi, Giovanni Volpato, Carlo Carrà, Giorgio Morandi, Giuseppe Capogrossi and Carla Accardi. 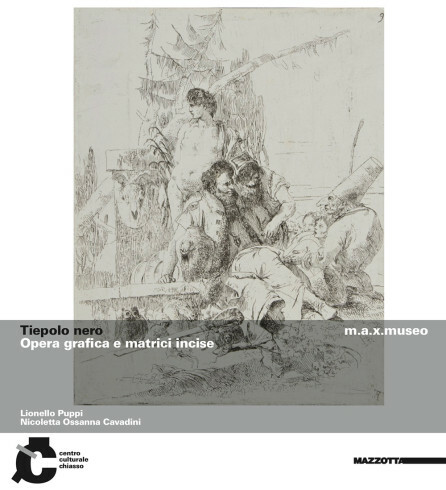 The volume investigates the watercoloured engravings by the famous Venetian painter Tiepolo, including “Tiepolo Nero”, a rich collection of images whose conception and aesthetic-executive quality are a landmark in the history of modern graphic art. The publication contains contributions from leading experts on the subject and provides full documentation of the materials exhibited during the exhibition at the m.a.x. museo in Chiasso. 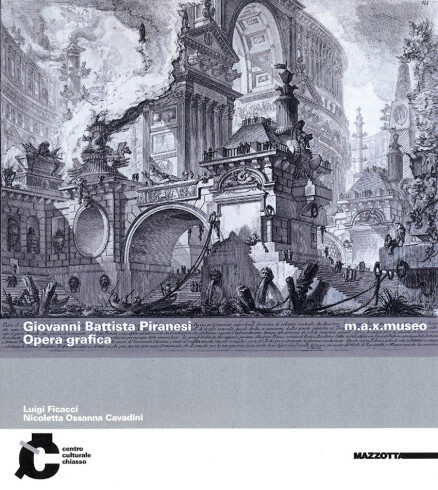 The volume devoted to Giovanni Battista Piranesi (1720-1778) belongs to the strand of historical graphic design. With his graphic work Piranesi sanctioned the epochal transition the between Ancient Regime and the spirit of modernity, making him the bearer of that cultural renewal introduced by the rising world of Enlightenment ideas. The illustrations represent a section of Piranesi’s immense output, some sixty engravings, and five important matrices that clearly represent his radical innovations directed at the values ​​of utopia and modernity. Piranesi’s visionary power, expressed in the etchings and clearly demonstrated by the essays in the catalogue, exerts a strong fascination and emotional appeal over the younger generations, as well as the most sensitive art-lovers.